Imagine that you have been given the go-ahead to upgrade your entire data platform stack from SQL Server 2008 Enterprise Edition to SQL Server 2014 Enterprise Edition. You need to come up with a recommendation for your new database server hardware, looking to maximize performance while controlling your SQL Server 2014 license costs. To help you with that effort, here is an example hardware analysis comparing an existing legacy four-socket server (a Dell PowerEdge R815) with four AMD Opteron 6168 processors to a new four-socket server (a Dell PowerEdge R920) with newer 22nm Intel Xeon E7 v2 Ivy Bridge-EX processors. 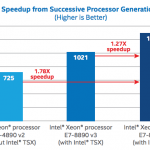 These three candidate processors all have higher base clock speeds and lower physical core counts than some other more common choices, such as the fifteen-core Xeon E7-4890 v2. The closest equivalent AMD-based system I could find in the TPC-E benchmark results (to the legacy system) was an HP ProLiant BL685c G7 Blade Server with four, 2.2GHz AMD Opteron 6174 processors and 512GB of RAM, with an actual raw TPC-E score of 1464.12. The raw TPC-E score is a good way of measuring the overall CPU capacity of a system. Dividing this score by the number of physical cores in the system gives us a score/core of 30.5, which is a good measure of single-threaded processor performance. Since the legacy system has slower 1.9GHz AMD Opteron 6168 processors (from the same generation and family), we simply need to adjust for the clock speed difference. Taking 1.9GHz divided by 2.2 GHz is 0.8636. Taking the actual 1464.12 score times 0.8636 gives us an estimated TPC-E score of 1264.46 for the legacy system. Dividing that by 48 physical cores gives an estimated score/core of 26.34 for the legacy system. There is an actual TPC-E result for a four-socket IBM System x3850 X6 with four, 15-core 2.8GHz Intel Xeon E7-4890 v2 processors and 2TB of RAM, with a raw TPC-E score of 5576.27. Dividing this actual score by 60 physical cores gives us an actual score/core of 92.94. We can adjust this actual result for the three candidate processors listed above to take into account the difference in core counts and base clock speeds to get estimated TPC-E scores for a four-socket system with each of those processors since they are from the same generation and family. This means that we could choose from having from roughly four times better single-threaded processor performance using the Xeon E7-8893 v2 processor or from having roughly four times more processor capacity using the Xeon E7-8857 v2 processor in a new system compared to the legacy system, depending on which processor we choose. The difference in SQL Server 2014 Enterprise Edition license costs between the different processor choices is quite dramatic. For example, going from the twelve-core processor to the faster ten-core processor lowers your SQL Server license costs by about as much as the actual server would cost. Great post, what do you think about 2-socket servers? Could be an good alternative if possible to split the load on more servers. A new two-socket server, such as a Dell PowerEdge R730, with the appropriate processors would also be a good choice. Very good article Glenn! I am very interested in your thoughts regarding a one Dell R920 with E7-8893v2 CPU’s vs two Dell R730’s with E5-2699v3 CPU’s. This new environment would run CPU intensive Oracle 12c workloads. Those two choices are pretty different, since the E5-2699 v3 has 18 physical cores, while the E7-8893 v2 only has 6 physical cores. That means you would have 72 total physical cores in two Dell R730 servers vs. only 24 physical cores in one Dell R920 server. In that case, the two Dell R720 server would give you a lot more total processor capacity, at 300% more license cost. The R920 would give you better single-threaded CPU performance because of the much higher base clock speed of the E7-8893 v2. A better comparison would be two Dell R730 servers with six-core E5-2643 v3 processors. In that case, I would prefer the two R730 servers for single-threaded performance because of the faster QPI link speed, faster DDR4 memory, and the small architectural improvements in Haswell-EP vs. Ivy Bridge-EX. Two R730 servers would have less total memory capacity than a single R920 server. I am going to use 2012 standard, or maybe 2014 standard. 2 Servers, but am limited to 8 cores per server based on existing licensing costs. So 8 cores standard Don’t know if I should be looking for a single 8 core proc or dual 4 core procs, or what. It’s not like I can go with a single 12 core and use only 8 cores for standard. If you are getting ready to buy a new database server, I would strongly prefer SQL Server 2014 Standard Edition over SQL Server 2012 Standard Edition, since the licensed memory limit (per instance) went from 64GB to 128GB. In a two-socket server, if you are limited to eight physical cores per server (and are sure this will not change later), I would prefer two, four-core processors rather than one, eight-core processor. This will let you use both NUMA nodes, and will give you twice the L3 cache (between both processors). The base clock speed will also be faster in the four-core, compared to the eight-core processor. For example, I would want two Xeon E5-2637 processors instead of one Xeon E5-2667 processor.